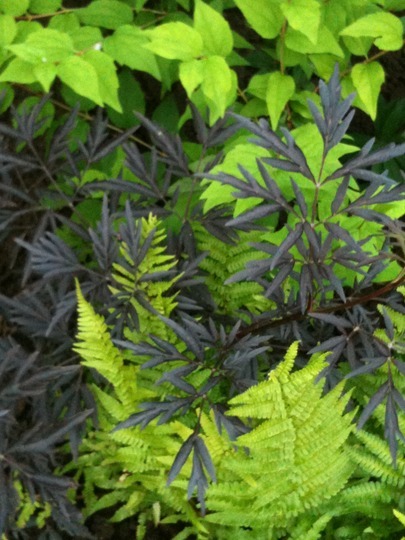 With foliage of Philadelphus and Shuttlecock Fern...this was an 'accident' but I love the contrast in the foliage. The Philadelphus will need to be moved but can stay here for the moment as I like the effect! what a lovely collection, i love those colours and textures together, ive put it in my favourites. i have sambucus but its the gold one, i thought the nigra wouldnt show up here, but now i can see how it would work, thank you. Lovely scottish, a nice accident! Very nice! Must make a note so that I can try this next year. Lovely effect. Ferns are so under rated but they make a smashing contrast here. I'm going to try something like this with mine. Great. Lovely accident Scottish, I have 2 lack Sambucas in my front garden for the first time this year, there huge, there's bright pink cosmos growing through the foliage of the sam and it looks stunning, only thing is, I can't seem to capture the beauty of it on my camera! so frustrating...the bright green of the your shuttlecock fern (love them) look fab with the black sam..
Good luck Whitelillies - the fern is getting plenty of sun hence I think the colour is so bright. It doesn't seem to mind though! Young Daisy - I can imagine your scene, sounds lovely...try focusing in on a tiny bit and use that - I had similar trouble with getting a good shot of this lot, so it was easier to focus on just a little little area. I also had a bit of a light bulb moment the other day - I have a copper colour Physocarpus and an eryngium that was finally showing some signs of buds. Thought, great I'll move it to grow under the shrub the copper and the blue will look great together. Bad move!!! The eryngium didn't take the move well and is no more :( I'm sure it will recover but not enough summer left for it too make a difference now. I agree Crissue. They fit in anywhere. See who else is growing Sambucus nigra 'Black Lace'.